‘America: painting a nation’ was presented by the Art Gallery of NSW (8 Nov 2013–9 Feb 2014) as part of its Sydney International Art series. It was the most expansive survey of American painting ever presented in Australia, featuring almost 90 works, ranging from 1750 to 1966. As curatorial consultant I worked with AGNSW staff in the selection, layout and promotion of the exhibition, as well as contributing to the exhibition catalogue and writing and recording the audio tour. Lenders to the exhibition were the Terra Foundation, Chicago, thePhiladelphia Museum of Art, the Museum of Fine Arts,Houston, the Los Angeles County Museum of Art and the Virginia Museum of Fine Arts. Australian art museums have acquired American art in keeping with a conventional global narrative. That is, our museums begin their engagement with the ‘triumph of American painting’ after the Second World War, before tracing the impact of the relocation of the art world from Europe to New York. There are outstanding examples of abstract expressionism, po and minimal art in Australian museums but very little of earlier American art (save for nineteenth century photographic folios). 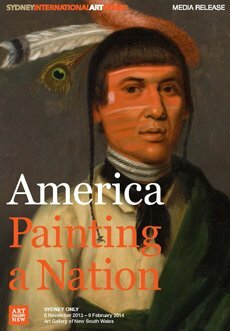 ‘America: painting a nation’ was an opportunity to introduce Australians to the fundamental narrative of American painting in a selection of works revealing the historical and regional diversity of American experience. While my own area of specialisation is twentieth-century American art, I rediscovered the pleasures of the colonial era. 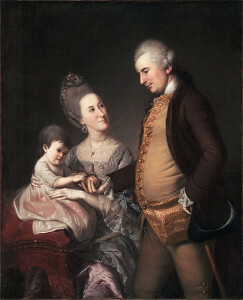 Charles Willson Peale’s Portrait of John and Elizabeth Lloyd Cadwalader and their daughter Anne (1772) is a striking example of colonial wealth and ambition; one of five family portraits in a single commission, designed to hang together in the Cadwalader home in Philadelphia. It’s about status and display but there are human touches, such as John Cadwalader’s gift for his child, and the wig powder staining the inner brim of his hat. Don’t be fooled by Cadwalder’s elegance. He was a colonel in the Revolutionary Army and in July 1878 fought a duel with one of General Washington’s critics. Having shot his opponent in the mouth, he declared, ‘I have stopped the damned rascal’s lying anyway’.